First things first. Director Hugh Hudson's cinematic follow-up to his Oscar-winning Chariots of Fire (1981), Greystoke: The Legend of Tarzan, Lord of the Apes (1984) is not particularly faithful to the events depicted in his source material, Edgar Rice Burrough's 1914 novel, Tarzan of the Apes. For instance, in this 27-million dollar movie adaptation, Tarzan (Christopher Lambert) does not meet Jane Porter (Andie MacDowell) in the jungle; nor return for her later in the United States; in Baltimore, and then Wisconsin, specifically. The film also largely omits Tarzan's varied (sometimes playful) interactions with a local village/tribe in Africa, plus his attempts to learn to read English himself. And the film's climax -- in which Tarzan returns to the jungle, leaving Jane behind (ostensibly forever...) -- is also not exactly canonical; though it can certainly be rationalized in movie terms, since everyone involved in the production was no doubt thinking/hoping "sequel." Importantly, however, Greystoke: The Legend of Tarzan, Lord of the Apes, does, in very welcome fashion, get at the human "truth" of the popular, often-told Tarzan story. Specifically, the film offers a realistic and believable excavation of that which Burroughs first imagined: the story of an orphaned human boy raised by apes in the wild, and his interactions with so-called human civilization. If the Richard Donner Superman: The Movie of 1978 was all about "you'll believe a man can fly," then this careful, painstaking iteration of Tarzan is, perhaps, "you'll believe a man can swing on a vine." And actually, that's no small achievement. Over the long decades, the silver screen Tarzan has been involved in the hunt for gold (Tarzan's Secret Treasure ), battled Nazis (Tarzan Triumphs ) and faced down evil cults (Tarzan and the Leopard Woman ). By deliberate contrast, Greystoke is a back-to-basics approach, focusing on the man and his identity rather than the pulp-styled enemies or cliffhanger challenges the character so often faces. Crafted with meticulous care -- with talented actors, gorgeous locations and Rick Baker's still-impressive ape make-up -- Greystoke was widely welcomed in theaters in 1984 as "one of the best movies" of the year. Joseph Gelmis wrote in Newsday (March 30, 1984, page 7) that it is a "serious movie, a thinking man's Tarzan. It is also ravishingly beautiful, provocative" and "profoundly moving." Much of that "profoundly moving" part arises from the considerable efforts of Christopher Lambert, an actor who is, in many ways at his absolute finest here. I also admire Johnny Weissmuller, one of Lambert's more prominent predecessors in the role of Tarzan, but Weissmuller's interpretation was a product of a different, more artificial/theatrical age in movie history. Weissmuller was a sort of muscle-bound body-builder-type, which today seems wrong for Tarzan. He was also a bit too clean-shaven and civilized to seem a believable man of the jungle. Greystoke knowingly adopts a more natural approach, and Lambert is absolutely believable as an animalistic figure, one almost constantly in motion. His Tarzan is a creature of instinct, curiosity, and barely-contained energy. Lambert doesn't look like a body builder, either. His Tarzan is a lean, strong man who has flourished in the wild, sustained by that which nature provides. And much of Lambert's focused performance -- the character's sense of cunning and intelligence -- arises in his penetrating eyes. Lamberts' eyes are like lasers here, targeting objects and, in an instant, assessing them as threats or non-threats. Lambert also carries all of the character's emotional pain in his eyes, and at times, this is a powerful choice. It's an accomplished performance. 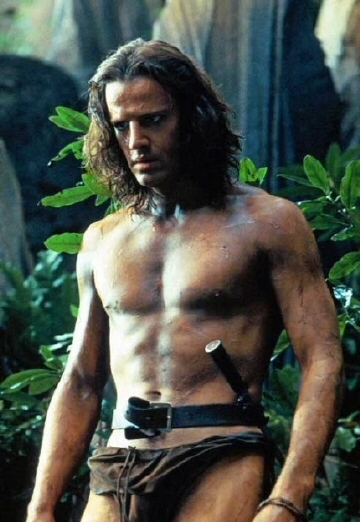 Jack Kroll in Newsweek described Lambert's Tarzan well, (March 26, 1984, page 74), calling him "a supple, feral creature, not an over-muscled hulk, whose animal grace becomes a human virtue and whose eyes, piercing but gentle, shows a keenness and clarity that over-civilized senses have lost." This description really nails the Tarzan persona of Greystoke. Tarzan is not a super-human "hero" in any way, though he boasts the survival skills of his adopted family, the apes. Instead, the movie finds the character's vulnerable, human core. Much of what Greystoke dramatizes is, in effect, Tarzan's sense of powerlessness in the face of mortality. As a baby, he is unable to prevent the death of his biological parents, the noble Claytons. As a teen in the jungle, he loses his ape mother, Kala, and is again. powerless to prevent death. Finally, upon return to civilization, Tarzan loses his kindly grandfather (Ralph Richardson) and even his ape father, who has been shipped to London to be studied. Thus life for Tarzan, as depicted in this film, is but a series of terrible losses; grief experienced and re-experienced. This viewpoint, I submit, helps to explain Tarzan's final choice to return to the jungle at the film's climax. When life is so short, when death lurks around every corner, we cling to "home," to the place that helps us remember those loved ones that we've lost. For Tarzan, that place of happier memories is the jungle. Unlike many Tarzan adventures of the silver screen, Greystoke also focuses explicitly on the differences between man's "modern" world and the primitive ape world of the jungle. Howard Kissel, writing a review in Women's Wear Daily (March 28, 1984, page 27), noted that Burroughs' book was written "when Darwinism and its social implications were still a dominant intellectual force." He goes on to suggest that "the book was aware of man's dual nature - simultaneously primitive and civilized." Greystoke gets at this point ably. It spends a little over half its running time in the jungle, as Tarzan ascends to the leadership of a local ape tribe, and about an hour in staid England, where instinct is derided and manners are treated as a paramount consideration. Here's the difference as I see it: In the ape world, nobody tried to control Tarzan. Or if they did...he confronted and dominated (or even killed) them. In England, Tarzan becomes a pawn of sorts, one who is supposed to "represent" something, perhaps, like the innate superiority of man over beast. "You must overturn what has happened to you," Phillippe D'Arnot (Ian Holm) suggests. at one point. But Tarzan isn't interested in being a case study. He doesn't need to be "greater than the accident of his childhood," or a triumph of the "Imperial Science." On the contrary, Tarzan is "what the jungle has made him" and just wants to be free to...live. As much as Tarzan loves and admires his grandfather, he knows that the land is not his to "sell" or "keep." His wisdom is different from the conventional wisdom of Darwin's England, and this also makes him a perpetual outsider. The duality of Tarzan 's nature -- part man/part ape -- is often expressed in Greystoke through shots involving a mirror (or a reflection). "Mirror" is one of the first English words Tarzan learns, for instance. Early in the film, while sitting lakeside with another ape, Tarzan also spies his own reflection in the water and can detect, for the first time, how different he is from those around him. Later, he discovers the hut where his parents died and -- again -- gazes into a mirror, expressing a half-remembered familiarity with the alien world of human civilization. Finally, when Tarzan courts Jane, Hudson shoots almost the entire scene inside the frame of a mirror, in a reflection. he inference is that by accepting Jane, by loving her, Tarzan fully enters the world of civilization, perhaps. There's a subtle message about human relationships here, as well. Jane loves Tarzan because he is not like the mannered buttoned-down men of the aristocracy, the men who are all around her. And yet, still, she wants to change him. As much as she admires him for what he is, she knows that in this state he is not an acceptable husband. Eventually, in a scene showcasing the nobility of women, Jane chooses Tarzan's happiness over her own. Greystoke is made with great care and love (from a script by Robert Towne, under a pseudonym). For example, I admire the beautiful book-end views of the jungle that open/close the film, a reminder that the life of Tarzan -- indeed all our lives -- is but a blip in the life of the Earth. The ape-suits by Rick Baker hold up remarkable well today, nearly thirty-years after the film's production. And the performances are particularly strong, with Lambert providing a strong, sympathetic anchor. Richardson and Holm also do great work, creating very sympathetic "father figures" for Tarzan. But two aspects of the film may prove troubling to some. The first is a technical issue. Andie MacDowell (playing Jane) is dubbed throughout the entire film by Glenn Close. Every time the young character speaks, there's an emotional disconnect between MacDowell's youthful appearance and Close's line readings. You can just tell something is off, and this fact diminishes the relationship between Jane and Tarzan in some critical, under-the-surface fashion. American accent or no American accent, MacDowell's line readings should have stayed in the film. 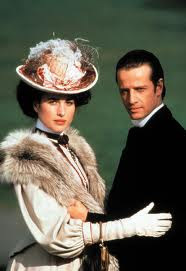 Americans Kevin Costner (Robin Hood: Prince of Thieves), Keanu Reeves (Bram Stoker's Dracula) and Julia Roberts (Mary Reilly) have all played British characters and were not dubbed in their roles, and MacDowell deserves the same courtesy. Secondly, Greystoke seems to go out of its way to not include or verbalize the name "Tarzan" in relation to Lambert's character. He is called Clayton, Jack, or simply Greystoke. I understand why this decision was made. It's another attempt to distance the character from his pulpy movie past and make this film a serious, believable interpretation of the legend. But Tarzan must be Tarzan...you can't hide his name any more than you can hide the name "Superman" (like Man of Steel attempted...) or "Batman." This movie very much wants to be about who Greystoke is -- his very identity -- and yet the name Tarzan ("White Skin") is a crucial part of that identity. The movie should have taken the name back for Tarzan, not ignored it. 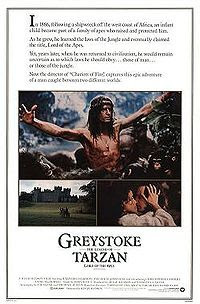 My feeling about Greystoke is that it is a great first movie in a franchise that, unfortunately, never arrived. The movie accomplishes the difficult task of taking Tarzan's world seriously; of making the character and his environs believable and authentic to a degree never before seen. I just wish there had been a second film in the franchise, one which captured a little more of the pulp; a little more of the adventurous spirit of the Tarzan stories we know from our pop culture. Rex Reed wrote In The New York Post (March 30, 1984, page 39) that Greystoke boasts "lavish detail," "opulent sets and splendid canvases of Scottish life on the heath" but "the second half resembles all too often a boring Masterpiece Theater production on Public Broadcasting." I wouldn't go that far, perhaps. 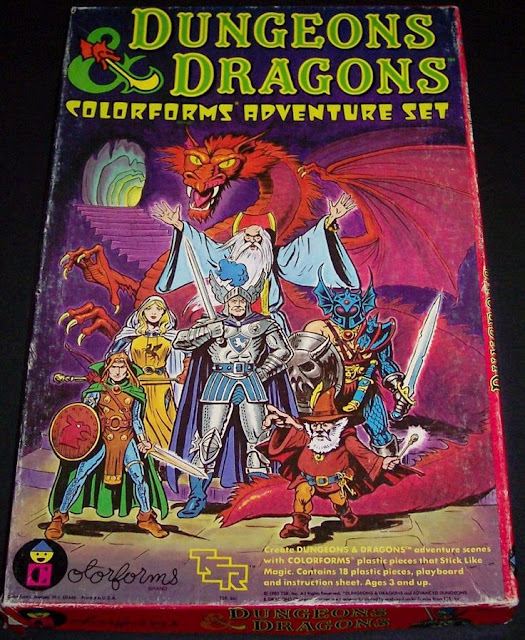 After all, what's the point of being the Lord of the Jungle if you can't rescue Jane from a few perils like quick sand, giant snakes, or rampaging elephant? Right? 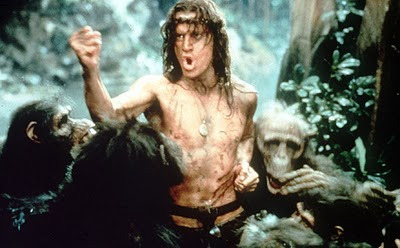 Greystoke remains a gorgeous and powerful movie, featuring perhaps one of the greatest Tarzans in film history (thanks to Christopher Lambert's performance.) Yet when its over, you do wish the movie had also let Greystoke be the Tarzan of our popular imagination, at least for a little while. I also would have enjoyed, I guess I'm saying, seeing a sequel with Lambert's Tarzan...fighting Nazis, Ant-Men and unearthing golden cities. Good review. I think this is the best TARZAN film ever made. I wonder if the new LEGEND OF TARZAN will surpass it in content.